The Open champ, 43, has started a strict health regime with a new fitness boffin designed to help him win another major before time runs out. The roly-poly Dungannon man will have to cut back on the fags or the booze as he travels the world this season and weighs up a return to the US Tour in 2013. Manager Chubby Chandler told The Golf Channel: “He’s gone in for this training lark a couple of times but now he has this Lee Westwood type personal trainer. Clarke has even started wearing glasses when he is not on the golf course after consulting with a new eye specialist. And he’s convinced that his scientific approach to fitness will pay off big time as he bids to prove that his Open win was no flash in the pan. Speaking in Portrush last week, Clarke said: “It has worked for Lee Westwood and it is something that I am taking very seriously. We’re talking diet, exercise, attitude, awareness, everything. It’s a lot more complicated than just having a personal trainer but it is something I want to do. “I have done this before with diets and exercises to get me but not to the extent of having the experience of the guy who is with me now and all these scientific methods. “He will get me off the range and into the gym instead of spending too many hours beating my head against a brick wall. Clarke will begin the new season in South Africa next week when he joins Padraig Harrington in the Volvo Golf Champions at Fancourt. But while he hopes to cash in on his major win this year by hoovering up appearance fees around the world, he could be heading back to the US Tour in 2013. Manager Chandler explained: “He’s exempt into every major until the end of 2016 and the Open for a long time after that. “That takes him to the age of 48 which means he only has two years before he gets his Champions Tour card. “He’s got lots of options and my guess would be that this year, because he is the Open champion, he can travel the world, play in tournaments, pick up the odd promotional fee. “He should make the money this year while he can but I wouldn’t rule out him joining the PGA Tour at the end of this year to play the year after. The past few seasons have been lean ones for Darren Clarke on the golf course but landing the 2016 European Ryder Cup captaincy could be worth up to €2.7m in endorsement income to the 46-year old over the next 18 months, possibly much more, easing him to his 50th birthday, when he becomes eligible to join the lucrative US Champions Tour. Darren Clarke has promised to try and keep the dark days to a minimum. Picture Credit / Phil INGLIS / www.golffile.ieDarren Clarke believes that killing off his “Prince of Darkness” alter ego could help him win this week’s sell-out Irish Open. Alan Dunbar hits his tee shot at the 7th in Tuesday’s practice round at Augusta National. 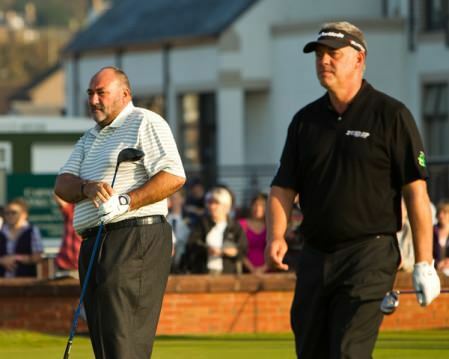 Pic via Frank Casey Jnr/rosapenna.ieChubby Chandler might be quietly mapping out the future of British Amateur champion Alan Dunbar but he’s also working hard to give struggling Darren Clarke “a new lease of life” by persuading him to rejoin the PGA Tour next season and avoid the “soul-destroying” grind of the early season European Tour schedule. Darren Clarke and Chubby Chandler. Picture, Stuart Adams, www.golftourimages.comDarren Clarke appears to have heeded the wishes of his long-time agent Chubby Chandler by opting to rejoin the PGA Tour next season.